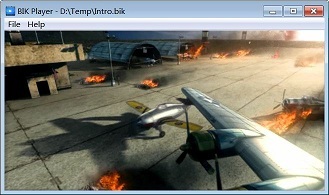 BIK Player is a free and simple player for Bink game video files (*.bik). If you are a gamer and often play various games, you will know that many well-made computer game animations are in Bink video format, how to play these files without running game? yes, this free software just can help you. This software is very simple to use, select "Open" in the "File" menu (shortcut key is "CTRL + O"), choice a *.bik file, then you can watch the video. The interface size of the software will automatically adjust by the video size (width and height). It also supports full-screen playback mode, by pressing the shortcut key F11, you can switch between normal window playback mode and full-screen playback mode. 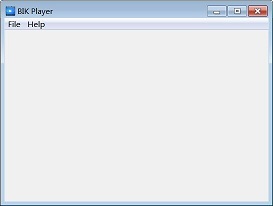 BIK Player is a freeware, free for personal and corporate (business, government, non-profit, etc.) use. 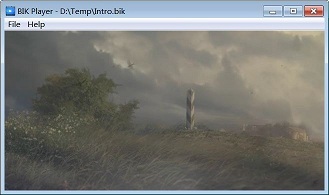 Bink is a very popular game video codec from RAD Game Tools, it contains a super video encoder, a multi-channel and multi-language support. This codec is very fast, at the same time, has a high compression ratio and good playback quality, system requirement is low, and it is compatible with almost all gaming platforms. Bink is a trademark of RAD Game Tools, Inc. Copyright © 2012 www.bikplayer.com, all rights received.